Adequate Intake based on Dietary Reference Intakes (Institute of Medicine. 2005). Actual water requirements may vary according to the physical activity, climate, weather, health and other conditions. How does the daily water intake calculator work? This water intake calculator will help you to estimate your adequate water intake per day. Whether you want to check daily water intake for an adult, teen, child or even infant, this hydration calculator can do it in no time. The values shown in our tool come from the Dietary Reference Intakes by Institute of Medicine. Remember that those are only the rule-of-thumb values, and the actual amount you need may depend on many other factors than gender and age: lifestyle, body size, ambient temperature, climate, your physical activity, metabolism rate, and general health condition. The values in the table are total water values - it means that they include water from food and drink. Water and other beverages represent approximately 81% of total water intake, and the water contained in food provides the remaining 19%. It's easy to notice that daily AI for men and women is 3.7 L and 2.7 L per day, respectively. 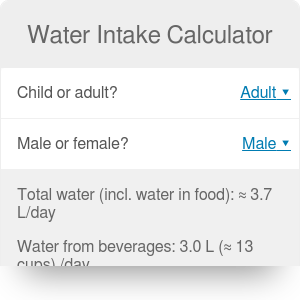 All these values may be found in our water intake calculator - it displays total water (from both food and drinks) and the amount you should consume in the form of beverages. Minimum water requirement is sometimes calculated from your weight - simply divide your body weight (in pounds) by 2. For example, for 180 lb person (~ 82 kg), the recommended water intake is in 90 fl oz (2.7 L). If you want to check that rough estimation, you can use our weight converter to change between the units, and similarly, for the water volume, you may find useful the volume converter tool. At least four hours before the exercise, drink the beverages slowly (e.g., 5-7 mL per kilogram of body weight). Drink during your workout. The hourly sweat losses are in 0.5 to 2.0 L/h ranges for vigorous physical activity, so the water needs may vary. Normal hydration state may be restored by standard meals and beverages. If you need fast and complete recovery from excessive dehydration, you can drink ~1.5 L of fluid for each kilogram of body weight lost. The most important rule, which can't be put into any calculator - listen to the signs your body is giving. Whenever you are feeling thirsty - have a drink. Have a look on your urine color - the lighter it is, the more hydrated you are. There are several conditions in which we should drink more - the most important is increased sweating (exercise, hot weather), but also the several disease states like diarrhea or vomiting. Then you need to trust not only your thirst but also common sense. Elderly and children experience thirst less intensely than adults, so make sure that your child is drinking enough water, especially during summer and physical activities. It's rare, but it's possible. Our kidneys can filter and excrete up to 15 liters of water every day, so it's really difficult. Overhydration is called hyponatremia, and it usually comes from not too much water but rather from an imbalance between water and electrolytes. But don't worry too much, you’d have to drink gallons of water to suffer hyponatremia, especially drinking lots of fluids lacking the proper electrolyte profile. You calculated the adequate intake with our hydration calculator, and it comes out that you need to drink much more water than you expected. The next question arises, which one you should choose: tap or bottled water? As in many countries tap water is perfectly clean, healthy and with good mineral content, we can recommend the tap water, echoing many governments and environmental NGOs. To check how much you can save rejecting bottled water, use our tap water calculator - you will be surprised how cheap the tap water is and how significant the potential savings are! Water Intake Calculator can be embedded on your website to enrich the content you wrote and make it easier for your visitors to understand your message.